As a life-long food allergy sufferer, and the parent of three food-allergic children, author and speaker Lisa Lundy writes and speaks from experience in her extraordinary cookbook dedicated to improving the lives of the more than 75 million Americans suffering from various food intolerances and sensitivities, the 2.2 million American celiac (gluten) disease sufferers, and 12 million Americans faced with life-threatening food allergies. More than a cookbook, this publication is actually the definitive textbook on the study of cooking for (and living with) food allergies, celiac disease, and intolerances. Whether you or someone you know are allergic to gluten (wheat), casein (dairy), lactose, eggs, nuts, or other foods, Lisa’s book offers cooking tips and a survival guide to what you should and should not eat. Overall, there are 225 recipes and over 100 pages of useful information to help you get your life back! To empower adults and parents in the area of food, food allergies, celiac disease, the gluten-free diet, the gluten-free/ casein-free diet, and health in general. To provide resources, products, recipes and information on these topics that will help consumers, practitioners, and organizations. To help you be able to bake and cook great foods for you and your family minus the offending gluten, dairy, eggs, tree nuts, peanuts, or other allergens. 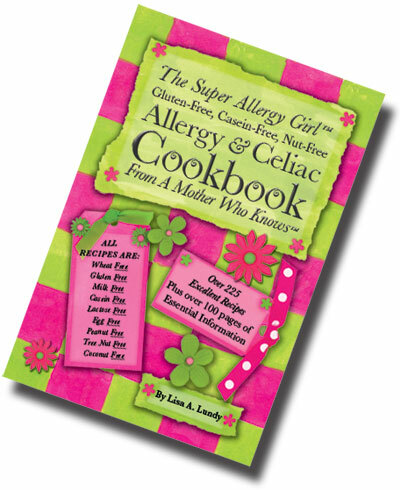 Check out her website at www.superallergycookbook.com to purchase your copy! This entry was posted in Egg Allergy, Food Allergies, Kids Allergy, Wheat Allergy and tagged casein, celiac, Cooking, Food allergy, Gluten sensitivity, Gluten-free diet, immunetech on February 23, 2012 by Kari Larson. I wish you the best of luck on your cookbook. There definitely needs to be more cookbooks available for people with multiple food allergies!